Chelsea Fine you are seriously one of my new favorite authors! I cannot wait to get my hands on more novels that you have written! I have always wanted to read Sophie & Carter, but for whatever reason just never got around to reading it so imagine my happiness when I won a mystery box of three novels and out pops Sophie & Carter. This was seriously a wonderful and enjoyable book. Sophie and Carter have hard lives, but only each other knows that. When they are at school they are just like every other normal teenager. They even pretend they don't know each other while at school to try and live a normal life, pretending they are strangers to one another and flirting in the halls, but when they get home they know what each other faces and they are willing to be there for one another no matter what. 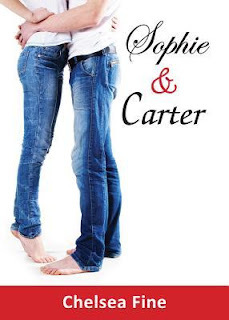 Sophie & Carter was such an enjoyable novel. I can't get over how much I love such a short book I mean its only 117 pages. It wasn't very dark, which I enjoyed, because sometimes you would rather just relive parts of characters lives through memories told by the character. I love how Sophie and Carter have this unspoken bond. They both have witnessed each others terrible childhoods growing up and silently help each other out every way they can without needs to say thank you or your welcome. Its like watching two people dance. Their relationship was truly graceful and beautiful. I think these two are perfect for each other and I couldn't find a character flaw in either of them except why didn't they take their relationship further sooner. I mean every night they meet on the front porch for only maybe an hour and then they part ways and say goodnight. If my life was as hard as their I would want to sit there with some else like me for at least three lol. I couldn't have been happier with the outcome of the novel and I wouldn't change a thing about Sophie & Carter besides making it longer lol. I truly didn't want it to end. I seriously cannot wait to read more from Chelsea, because she is an excellent story teller! I loved this novel! It isn't long at all, but it isn't too short either. Usually with shorter books you feel like more could have happened, but I think since Chelsea kept the story so simple and tried not to make it too deep it worked perfectly. I still wish it was a longer book, because I loved the story so much, but I think it is perfect the way it is. Chelsea and Carters characters are wonderfully done and I love their relationship. The way their interact with each other is so graceful and beautiful. It really just calms you think about how easy they move around each other. I highly recommend this novel to everyone everywhere who loves YA and I cannot wait to read more from Chelsea Fine! This sounds really good. I'm glad it's a book that deals with serious issues but isn't too dark. I dig a good love story every now and then as well. (Well all the time, really). this sounds like the perfect afternoon read..so glad you loved it. I grabbed your button and will add it to my blog this week. It's so exciting when you find authors you love! Yea it was a very nice combination of light & dark, but perfectly done.